When you want what no one else offers ONLY Salon Interiors will do. Your design expression is important to us at Salon Interiors and we recognize that each salon owner has a different vision, concept and plan. Salon Interiors specializes in creating the right design touch with the best furniture available in the industry; premade or custom. Whether you’re a new salon or looking to upgrade, Salon Interiors can help! We make it our business to get to know each client personally to fulfill their design goals. Salon Interiors has been an industry leader in salon and spa furniture for almost forty years. Salon Interiors never forgets to take your input and build on your dream salon within your budget. We at Salon Interiors know that any change can be scary that’s why we’re with you from the beginning to the end. Salon Interiors works with you from design concept to unveiling your completed new look. Our long time experience serving the salon industry makes all the difference in the world. Excellence by Design. 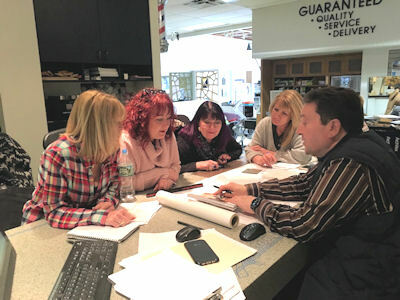 With our staff of experienced design professionals, we provide the artistic skill, creativity and knowledge needed to take your project from concept to completion. We blend art, architecture and cabinetry with detail-oriented project management to offer you the very best in the industry. For over 20 years we have been leaders in providing step by step in-house service. We can take you every step of the way, from plans to construction documentation, to manufacturing, to delivery and installation. Our expansive, modern facility has the newest in high-tech equipment, allowing us to fulfill all of your project needs, whether you choose from our showroom selection or create something customized to fit your taste and needs. We carry the latest exclusive salon furniture from Europe and we represent all international brands. We stock the newest and best of the world's hair styling equipment, as well as the classics. We can manage and support every detail of your project. Salon Interiors is always on the cutting edge of salon design, featuring the latest offerings of all major beauty furniture suppliers. We all provide detail oriented repair services and personalized attention and service to ensure your salon reflects the image you want it to portray. Call us today at 800-642-4205 or send us email to inquire about our services. You can view some some of our past salon designs and furniture placement in these floor plan sample files.